Sorry for the photo ... this was dinner and I was hungry! Here's a book with an interesting concept. 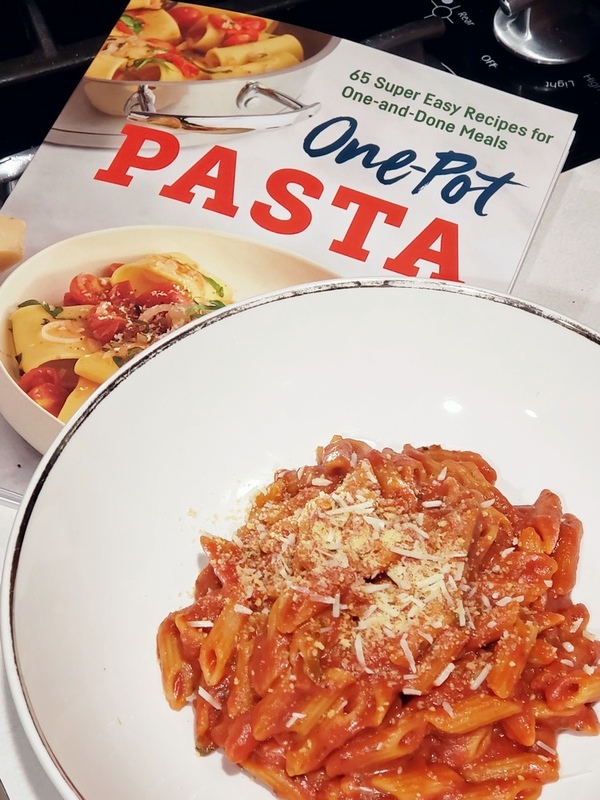 It's called One-Pot Pasta, and it's written by Sarah Walker Caron. Not only is everything cooked in the same pot so you don't have to dirty everything in the kitchen, but a large number of the recipes have you putting all the ingredients into the pot at the same time. Versions with meats rather than all veggies sometimes have you browning the meat first and adding it later, while seafood recipes tend to add the seafood at the end, since it doesn't take a long time to cook. But for the most part, the pasta doesn't get cooked in a separate pot. It goes right in with everything else. In a way, it makes a lot of sense (and it's kind of genius, really), since you're cooking your pasta in something flavorful rather than plain water. On the other hand, you have to make sure the amount of liquid is exactly right, and everything needs to be finished cooking at the same time. It's not a project I would have embarked on. But I was more than happy to cook from it. My first try was a basic mac and cheese, because the idea of tossing it all in the same pot and letting it go sounded like a great time saver. It nearly made a heck of a mess on my stove, though, because when you boil milk, it likes to boil over. Keep an eye on that, for sure. And then my cheese wanted to separate into clumps instead of melting smoothly, which wasn't optimum. I stirred a lot at the end and when the liquid was mostly gone the cheese decided to get more melty. Next time, I'll try a different cheese, perhaps, and see if it's more willing to melt. One little glitch in the book, too ... the recipe calls for parmesan cheese in the instructions, but not in the ingredient list. I added a small hand full, and contacted the author after I ate. She said there should be no parm in the recipe. But, you know, it's a mac and cheese recipe, so a little extra cheese isn't a bad thing. Sprinkle some on top, if you want. It's your dinner! Then I tried the Saucy Spaghetti Marinara. I mean, when I make pasta, I add the sauce to the al dente pasta so they can marry a bit - but this takes it to a whole other level, cooking the pasta in the sauce from the beginning. And since you're only cooking for as long as it takes to cook noodles, dinner is done in no time. Obviously, this isn't nonna's long-simmered sauce, but that's fine. And, once you've made this, you can adjust the spices to your taste. I used mini penne instead of spaghetti, because I had half of a one-pound box, after using the first half to make the mac and cheese (scribbles a note to add pasta to the shopping list). When I put the noodles into the pot with the tomatoes and water and spices, I was skeptical. I thought I was going to end up with tomato soup instead of a pasta dinner. In the end, the pasta absorbed enough liquid so it was actually a pasta dish. If you have an Italian nonna in your family, she might not entirely approve, because this is not at all the way Italians would dress their pasta. This is a super-saucy American version. I was glad the recipes I tried called for 8 ounces of pasta rather than a full pound. I try to cook recipes as they're written the first time, but ... when a recipe serves 8 people, that's just a LOT of food to cook for little ol' me. So, I try to cut them in half, which is a great thing until I run into the dreaded recipe with 3 eggs. Sigh. When a recipe starts off a little smaller, people who want more can simply double the recipes. This book certainly has an interesting hook, and it's going to be a time-saver for folks who want dinner on the table in the time it takes to cook the noodles. I'm definitely going to browse the book some more and see what other amusing ideas I can find. I got One-Pot Pasta from the publisher at no cost to me.